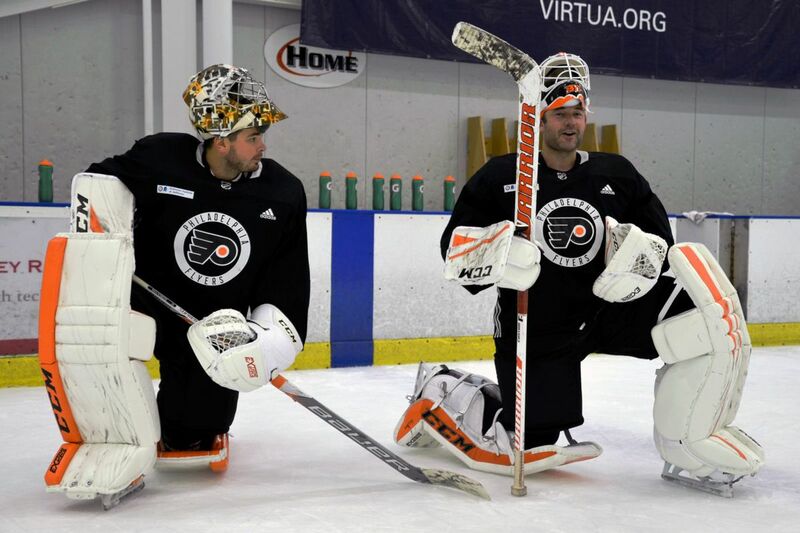 Flyers goalies Michal Neuvirth (left) and Brian Elliott. To those not familiar with the way the matured version of Ron Hextall thinks, it always seemed an oddity that a former No. 1 goaltender would be content with entering an NHL season without a clear No. 1 goaltender, content instead to man the position with two middle-market entities as he has with Brian Elliott and Michal Neuvirth, and as he once had when Steve Mason was here. Hextall would not have liked it any more than Mason did, which was a contributing factor to the parting of ways. Yet neither Mason nor Neuvirth was the reason the Flyers fell in the first round of their only playoff appearances over the last five years. Indeed, each played well enough to mask the disparity of play against the Rangers four Aprils ago (Mason) and the Capitals two years ago (Neuvirth). And if the Flyers, currently sitting in third place of the Metropolitan Division and riding a four-game winning streak as they take on the New Jersey Devils tonight at the Wells Fargo Center, do not reach the postseason again this year, Elliott or Neuvirth would be the unlikely villain. Both have had their moments of faith and doubt over this uneven season. Neuvirth's 38-save performance in the Flyers' surprising 4-1 road victory over Vegas on Sunday underlines what a difference maker he can be when his "A" game arrives like an unexpected gift – as it did when he came in cold and rescued the Flyers during a shootout win against Arizona the night before. Elliott, again on the shelf indefinitely with what is believed to be a recurrence of a groin injury, is the most identifiable reason the Flyers are even in third place at this hour, his spirited and exceptional play in December and January rescuing them from that 10-game winless streak that appeared to have buried them. "When you have two goalies able to step up when you need them to, your confidence – being comfortable on the ice – it's better,'' Flyers captain Claude Giroux said. The Devils, on the other hand, are feeling the hardship of their lack of depth at the goaltending position. Cory Schneider, in the third year of a seven-year deal that pays $6 million annually, has missed the last eight games and is not expected to even begin skating again until next week. The Devils' nosedive, in which they have lost eight of their last 11 and four in a row, coincides with that absence, their options being two longtime backups – 30-year-old Swede Eddie Lack, who was in the nets for Sunday's 5-3 loss to the Bruins, or 28-year-old Keith Kinkaid, who made 44 saves in a 6-1 loss to Columbus on Saturday in his 20th career start. Kinkaid is expected to get the start tonight. Combined, the salaries of Elliott ($2.75 million annually through 2018-19) and Neuvirth ($2.5 million through 2018-19) do not add up to the salary the Devils are on the hook for through 2021-22 for Schneider. Already 31, he averaged 62 games over the three seasons previous to this one – all of which ended without a playoff appearance. That's hardly his fault. His goals-against average and his save percentage have justified the salary thus far. But four more seasons? He will have to prove as durable as his predecessor, future first-ballot Hall of Famer Martin Brodeur. And if his current status lingers long enough to sabotage the Devils' promising season, it's fair to question the contract even now. The Flyers, meanwhile, soldier on, banking on Elliott's eventual recovery or the continuance of good Neuvy. Neither is the safest of bets. But for now, at least, you'd rather have Hextall's hand than that of New Jersey general manager Ray Shero. Scott Laughton was missing from the morning skate, although Flyers coach Dave Hakstol said he was still available to play tonight. The flu bug has already hit Michal Neuvirth and. more recently, captain Claude Giroux, who nonetheless received the NHL's 1st Star award for his six-point effort in wins over Carolina, Arizona and Vegas. The Flyers did not update the status of Elliott. … The Devils power play was anemic in their 5-3 loss to the Bruins on Sunday, going 0 for 7 with just eight shots. They also allowed two shorthanded goals.